After spending 10 days of the school holidays out west at Winton, Hughenden and Richmond digging up fossils with the family, Monday public holiday was my only chance to hit the water. Wanting to make the most of the day, I thought it would be a good opportunity to grab Andrew and head up to Hinchinbrook Channel. The tides were pretty good, and the weather was dropping. So the alarm was set for 3am Monday and we were on the road by 4. After putting the boat in the water just before 6am we made use of the calm conditions and ran to the end of the sugar loader to look for a Fingermark. Its was a very smooth 10 minute run. But after sounding around the structure with the Humminbird 998 it quickly became apparent that there was a distinct lack of baitfish. Dion Forman, author of About Fishing NQ, was reporting on his Facebook page of a quiet morning the day earlier. But we persisted and eventually I managed to hook up a solid Fingermark on a Gulp Squid-Vicious. This was the first chance I have had to put the new Stella 4000SWB and TK3G 701 through its paces. But, despite the extreme drag capabilities of this reel, the 20lb Power Pro peeled off as the fish founds its home among the pylons. I'm not sure 80 would have even stopped this fish! After this we headed up the Channel to fish the outgoing tide. But despite looking around numerous creeks and headlands, we just couldn't find any decent supply of bait. And as a result, the predators were in short supply. We managed a handful of small Fingermark and Cod, but nothing substantial. Eventually the tide dropped out of the mangroves and we found a couple of fish on the snaggs and in the drains. The first Barra was good solid fish that I got to watch rise and smash my Flatz Rat at the mouth of a small drain. But despite a very solid hit and run, the hooks pulled and fish swam off! 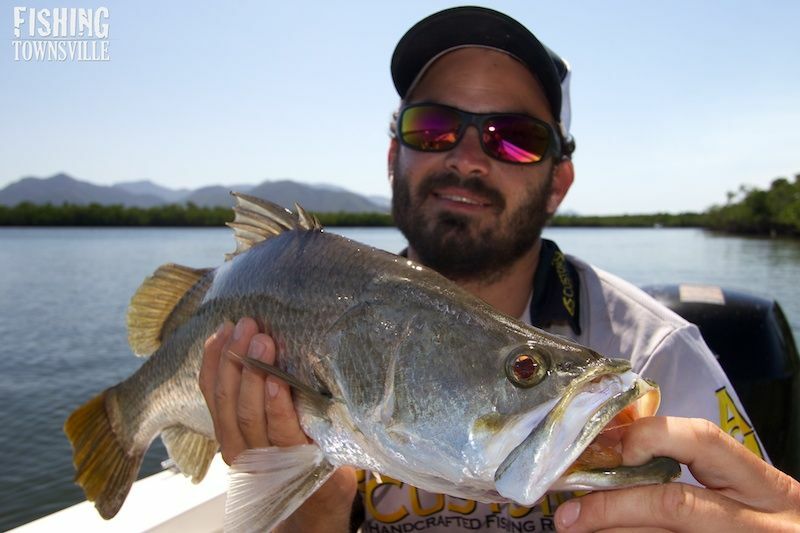 A few casts later and decent Mangrove Jack hit my Flatz Rat the moment it hit the water beside a snag. A nice 40+ fish, this one came to the boat with a second sitting underneath it! In the net and in the eski, dinner! This was my first fish on a new Shimano Chronarch E7 and G•Loomis 644 combo. Loaded with 20lb Power Pro I have long said that this is the perfect combination for flicking hard bodied lures among the snags for Barr and Jack. A really well priced and capable setup. Then Andrew spots a Barra sitting tight against a snag. 'Look at that one to the right of that tree' he says. 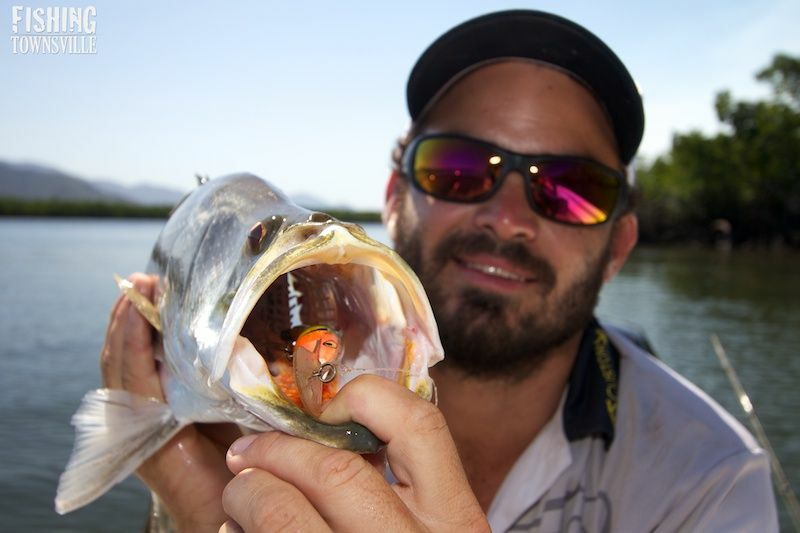 He put in a perfect cast and the Barra turned on the lure the moment it hit the water. But then it just sat looking at the paused lure suspending nicely in the water. One more small twitch and BANG, he hit it hard and launched from the water. A definite legal, and with the luck we had been having, we took it easy. A couple of surging runs and shakes of the head made us quite nervous. But with the lure well down the fishes gob, it was easily lead to the waiting net. Around the mid 60's, its was good to finally have one in the boat. The tide soon dropped too much and most of the snags were out of the water, and the drains were all empty. So we decided to make the run for home. It was extremely sloppy crossing the channel in the afternoon. Strong winds and and the last out the outgoing tide made for a very we run. About half way across I remember turning to Andrew, who was dripping with salt water, and saying 'go Barra fishing they said.... It will be fun they said...' We just laughed and kept going! 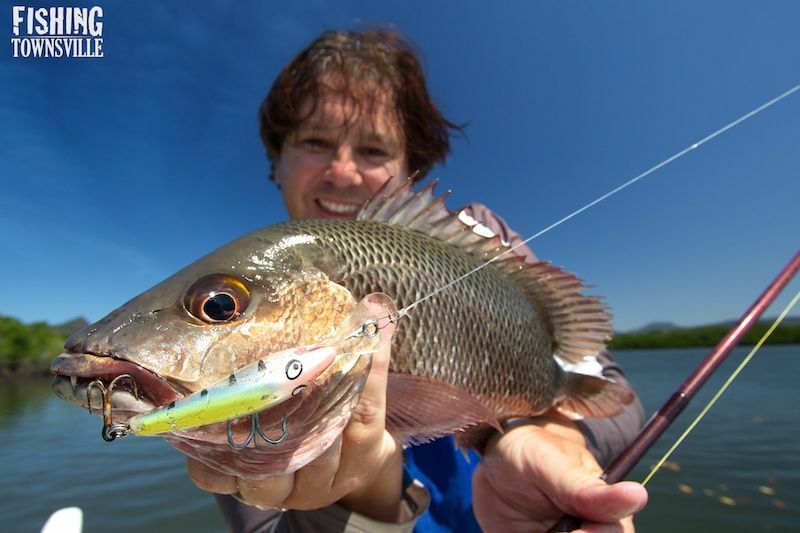 Slow finish to Barra season!